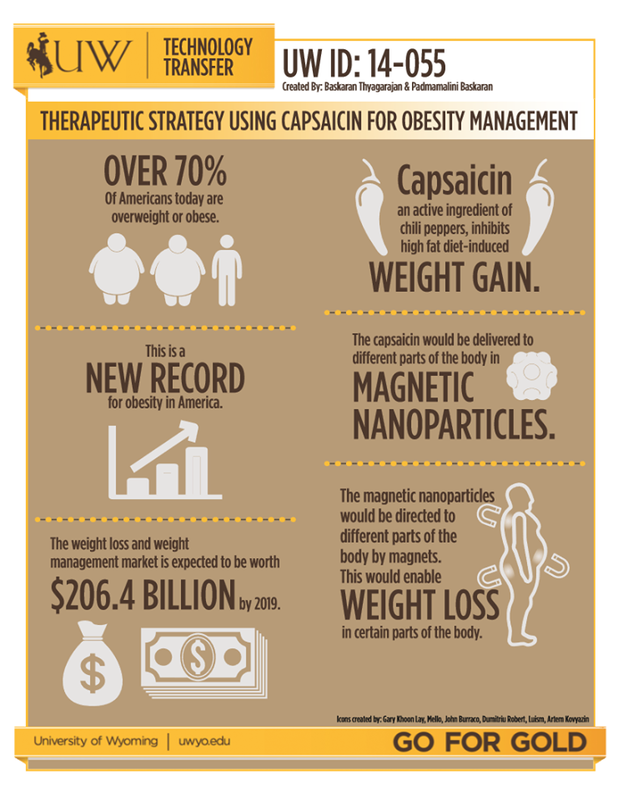 Dietary capsaicin has the potential of becoming a therapeutic agent for managing obesity. Preliminary data demonstrates that capsaicin, an active ingredient of naturally available chili peppers, inhibits high fat diet-induced weight gain by activating an important regulator of cellular metabolic processes in the body. Researchers at the University of Wyoming are investigating a new therapeutic drug delivery system for dietary capsaicin using injected magnetic nanoparticles. An external magnetic field would trap the nanoparticles at specific sites throughout the body. A nanoparticle based drug delivery system may offer the advantage of increased bioavailability of poorly water-soluble compounds. The nanometer size of the particle provides a larger surface area for drug absorption across biological membranes. Coated nanoparticles may provide a robust and sustained delivery of dietary capsaicin. Dietary capsaicin may be used by individuals looking for a non-invasive therapeutic treatment for abnormal body-weight gain. The obesity drug market in 2010 was $420 million; this market is expected to increase to $2.6 billion by 2020. Using therapeutic agents like dietary capsaicin, offers new business potential for developing pharmacotherapies and treatments to manage obesity. This product may have high revenue potential in the healthcare industry. Available pharmacotherapies, bariatric surgery and dietary modifications are not applicable for all patients, therefore it is important to develop robust and reliable pharmacotherapies to prevent and manage obesity and other complications including vascular dysfunction, hyperglycemia, diabetes, etc.